Sometimes it’s hard to know what is acceptable to deduct and what isn’t. Because most people would rather have a root canal without anesthesia than go through an IRS audit, we tend to leave many deductions out that are rightfully ours to claim. This is especially true if you run a home business. While filing taxes with simple entries from a job can be straightforward, itemizing deductions and determining what’s acceptable for resources used in the home can be confusing. 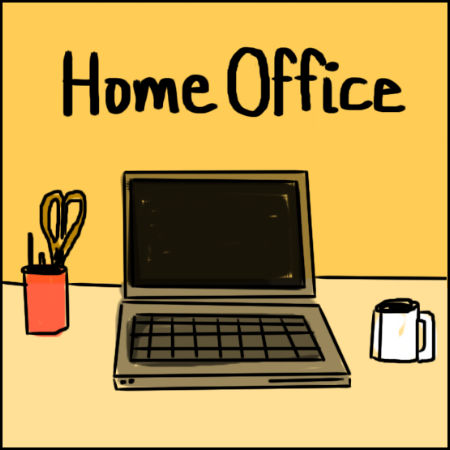 This animated illustration can help simplify the typical home-office deductions. The green portions show what is eligible and provide information when the mouse hovers over them. For example, the door shows a pop-up window explaining that work related expenses from your home expenses can be deducted if you use it as a workplace. And you can deduct a percentage of your phone and its accessories if you use it for business. Office supplies are an obvious deduction and so is equipment. What might be less obvious is that the cost of repairs to the equipment can also be deducted. Your whole home is not your office, so you will have to figure out what percentage of your home your office takes up. But you can deduct that percentage of some utilities because of business use. And of course most businesses today need to be connected to the internet for a multitude of reasons. Because of this, the respective percentage of internet costs used for the business can also be deducted. If your business requires you to travel, there are additional deductions for the cost of travel, including airfare, hotels, meals and car rentals. This can take some of the sting out of traveling to secure and maintain clients, but remember, you can only deduct appropriate amounts for each expense. And as we all know, competing in business requires more that a good product at a good price. The economy is constantly changing and so are people’s needs. The good news is that you can deduct the expenses of staying current on your industry. That can mean taking classes or buying books or software for continued learning. And if your industry requires that you are a member of an organization to work, those dues are deductible along with contributions to your retirement through specific individual retirement accounts (IRA). And if your company provides health insurance, those expenses can be deducted too. Because everyone wants to avoid audits, penalties and punishments, the key rule is that the expense must be clearly for the purpose of the business. Many times people have deductions that might tangentially relate, and they might even be legitimate, but the farther removed from the direct line of business and expense is, the more likely it is to raise a red flag. An example is security. Although you may want to provide a security system for your home or simply a lock-box to put your valuables in. Even if these valuables are business assets, the security system is probably a stretch. If you were required to provide a secure place for employees to lock their items, like if you were running a school or department where changing clothes were required, providing lockers on a one time expense or renovating dilapidated or outdated lockers could become a viable deduction. The key is that there is a clearly determined business purpose for the expense deducted. The key to doing your taxes right, getting all of the money that is rightfully your is not to under-claim your deductions but to claim everything that is appropriate, to the right percentages with the correct allowances. That can be the tricky part. Make sure you use all of the modern assistance available to you through software or consultation, because that money is yours. You earned it and you don’t want to trigger an IRS audit. Jerry Mooney is co-founder and managing editor of Zenruption and the author of History Yoghurt and the Moon. He studied at the University of Munich and Lewis and Clark College where he received his BA in International Affairs and West European Studies. He has recently taught Language and Communications at a small, private college and owned various businesses, including an investment company. Jerry is committed to zenrupting the forces that block social, political, and economic justice. He can also be found on Twitter.